On its 15th year as an award-winning national student art competition, Vision Petron recently announced the winners of the 2015 competition themed Lakbay Kasiyahan: Our Journey of Happiness. The winning artworks are featured in Petron’s corporate gifts and merchandising materials for 2016. Petron’s corporate gifts and merchandising materials for 2016, including an e-calendar with inspirational quotes, feature the winning artworks of students from all over the country. Particularly gratifying is the fact that the Vision Petron 2015 winners are well represented from Luzon, Visayas, and Mindanao—proof of the huge pool of Filipino artistic talent among the youth. Weriel Mallari, a student of Tarlac State University, had the distinction of winning two grand prizes in Painting. 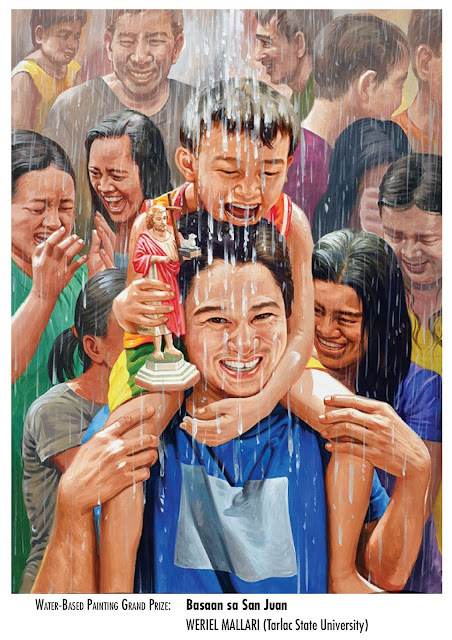 His work, "Libre Lang Maging Masaya, May Sukli Pa" won a grand prize in the oil/acrylic painting category, while "Basaan sa San Juan" earned a grand prize in the water-based painting category. Other Painting grand prize winners for Oil/Acrylic were "Smile! All is Well!" by Wencyl Ureta from Museo ng Bulacan, and "Hapag Ng Kagalakan" by Modesto Samonte, Jr. from the College of the Immaculate Conception, Nueva Ecija. RUNNERS-UP: "Tara let’s! Ligo sa Ulan!" by MARJEAN CLAUDE SAMONTE (Imus Computer College, Imus Main Campus), "Cradle of Happiness" by KURT MORRIS ROJAS (University of Mindanao), and "A Celebration of Life" by GARRY ALLEN WATIN (Kimsoy Yap Summer Art Workshop). SEMIFINALISTS: "Memories Last Forever" by JOHN VERLYN SANTOS (Bahaghari Art Workshop), "Pagpapala sa Gumabay at Nagtagumpay Kasiyahang Walang Kapantay" by JUNENARD PASION (Lakandayang Cultural Group), "Sa Likod ng Aming Kasiyahan" by EUNICO ARELLANO (EARIST), "Vision of the Inner Us" by JASHIEL DOMINIQUE RAMOS (University of Mindanao), "Picture is Perfect When It’s Full of Happiness" by ERIC PERRERAS (Museo ng Angeles), "No Place Like Home" by JAYME EMILLE LUCAS (Tarlac State University), "Smile Pilipinas!" by CHRISTIAN MACALINAO (EARIST), "Masaya na Kami" by JOHN RAPHAEL CARLOTO (Technological University of the Philippines), and "A Rise to Eternity" by FRANKLIN CAJUMBAN (Laguna State Polytechnic University). In the Water-based Painting category, the grand prize winners were "Aanhin ang Masarap na Ulam Kung Wala Naman ang Magulang" by Eric Perreras of the Museo ng Angeles, Pampanga; and "Surprise" by Arman Jay Arago from Kulay Diwa Gallery. 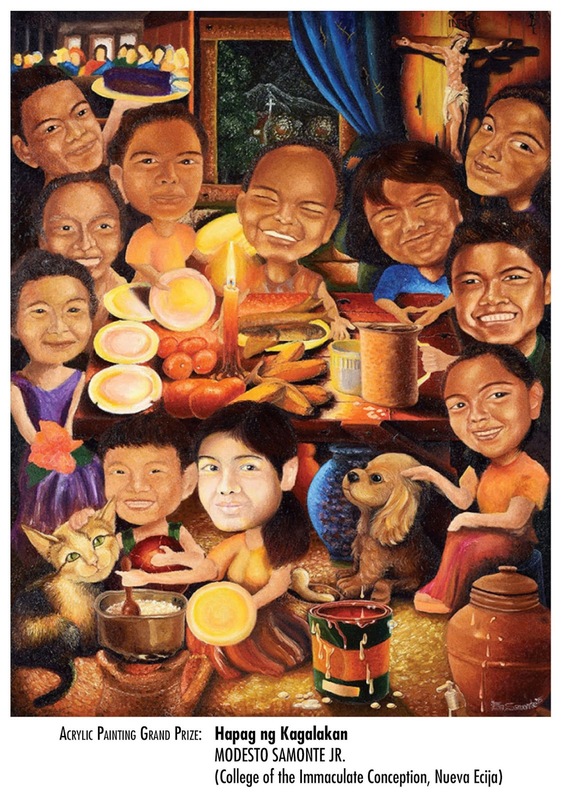 RUNNERS-UP: "The Harvest of Abundant Joy" by JIRAH LABANZA (Iloilo Science and Technology University), "Biruan" by WENCYL URIETA (Museo ng Bulacan), "Bigyan Natin Ng Kulay Ang Bawat Hakbang" by ALDRIN RYAN APOSTOL (Cebu Technological University). SEMIFINALISTS: "Aking Alaala, Aking Kayamanan" by JHON MICHAEL MACARIOLA (Lakandayang Cultural Association), "Happy Fiesta" by KEVIN CUBINAR (Pamantasan ng Lungsod ng Maynila), "Mga Ngiti Pagkatapos ng Dalumhati" by BENJAMIN ALBA JR. (Kulay Diwa Gallery), "Minsan Lang Tayo Bata" by JESSIE TADEO JR. (Tarlac State University), "Joy is Not in Things, It is in Us " by CHRISTIAN JAIME MAGLENTE (EARIST), "Panibagong Simula" by LYMUEL BAUTISTA (Kulay Diwa Gallery), "Kaligayahan sa Kabila ng Lahat" by DHAX DARYL DALETH REYES (Bulacan State University), "Burador" by ROLAND LLARENA (Iloilo Science and Technology University), and "Action to Happiness" MA. ELENA DEFEO (PUP Manila). 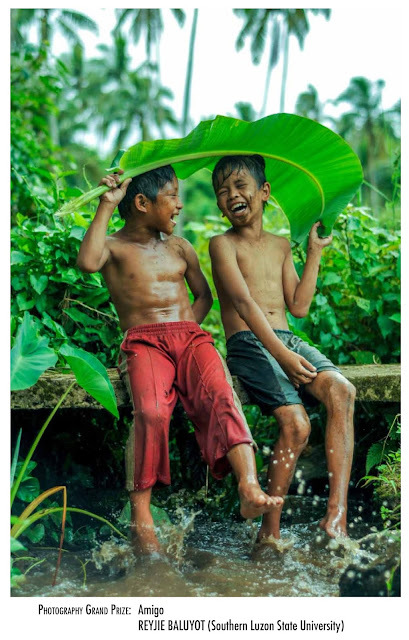 For Photography, the following works were awarded the grand prize: "Shadow+Play" (Jenevie Estrella, Partido State University); "Mga Angel sa Calangitan" (Joel Policarpio, Museo ng Probinsya ng Tarlac); "Amigo" (Reyjie Baluyot, Southern Luzon State University); "Sumisilip na Kasiyahan" (Vincent Gerard de la Rosa, Tanauan Institute); "Ingiti Mo" (Jana Patricia Padre Juan, EARIST); and "Liguan Na!" (Jal Valdez, Adventist University of the Philippines). RUNNERS UP: "Swing Low" by JENEVIE ESTRELLA (Partido State University), "The Filipino Resiliency" by REYVIE BALUYOT (Southern Luzon State University), "Sarap at Saya ng Pagiging Bata" by JERRICA SABARIAGA (Technological University of the Philippines), "Alapaap" by REN STEPHEN DINGLI (Tarlac State University), "Repleksyon ng Makulay na Samahan" by JOEL POLICARPIO (Museo ng Probinsya ng Tarlac), and "Splash of Fun" by FERDIANNE ANTONIE BERMUDO (Bataan State Peninsula University). In the Video-Making category, the three grand prize winners were: "Lipad" (Rizzelle Mae Santiago, Nueva Ecija University of Science and Technology); "Para Sa ‘Yo Kaibigan" (Vyankka Balasabas, University of Mindanao); and "Tingnan Nang Malapitan" (Anne Catherine Malazarte, University of San Agustin). 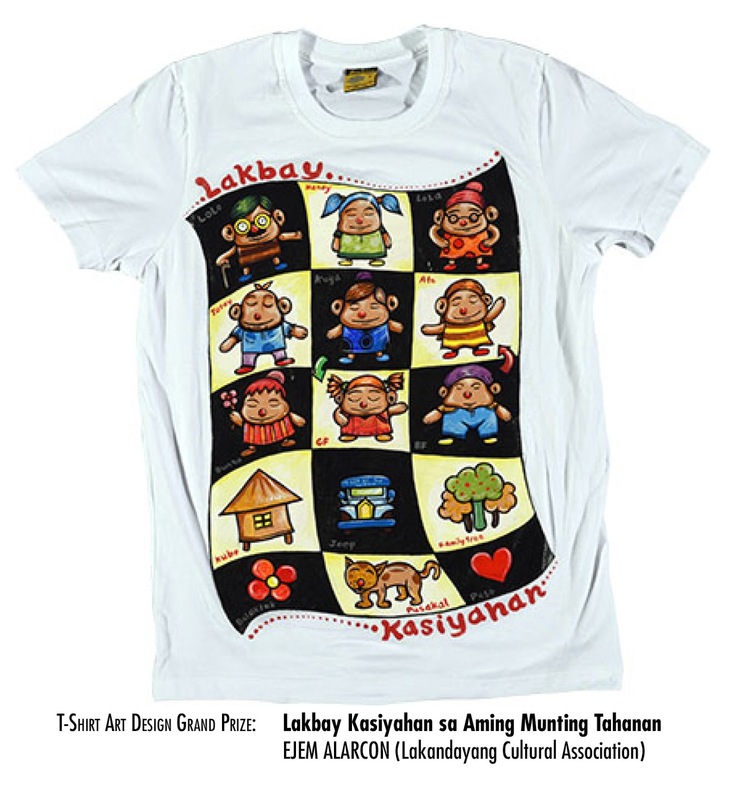 Finally, for the T-Shirt Art Design category, the three grand prize winners were: "Lakbay Kasiyahan sa Aming Munting Tahanan" (Ejem Alarcon, Lakandayang Cultural Association); "Hiling" (Jonathan Villalobos, University of the Cordilleras); and "Happinas" (Deo Carlos Amarante, EARIST). SEMIFINALISTS: "Mga Batang Espanya" RACHEL BATISLAONG (FEU Manila), "Real Happiness" by JONATHAN VILLALOBOS (University of the Cordilleras), "Lakbay Kasiyahan Para sa Pinagpalang Bansa" by DEO CARLOS AMARANTE (EARIST), "Pananampalatayang Walang Hanggan" by EJEM ALARCON (Lakandayang Cultural Association), "Roadtrip with An Extended Family" by TIMOTHY BRYLE FLORES (Mapua Institute of Technology), "Happiness Through Peace and Love" by JIRAH PASTRANA (Bulacan State University), "Kung Bakit Tinatawag na Happy Lang, Walang Ending Ang Aming Kwento" by ANIKA BIENE PADRIGO (Mapua Institute of Technology), "Keep Going!" by MARIA ELENA DEFEO (PUP Manila), "Pyesta" by CHRISKINDLE JOY SANTIAGO (De La Salle College of St. Benilde). 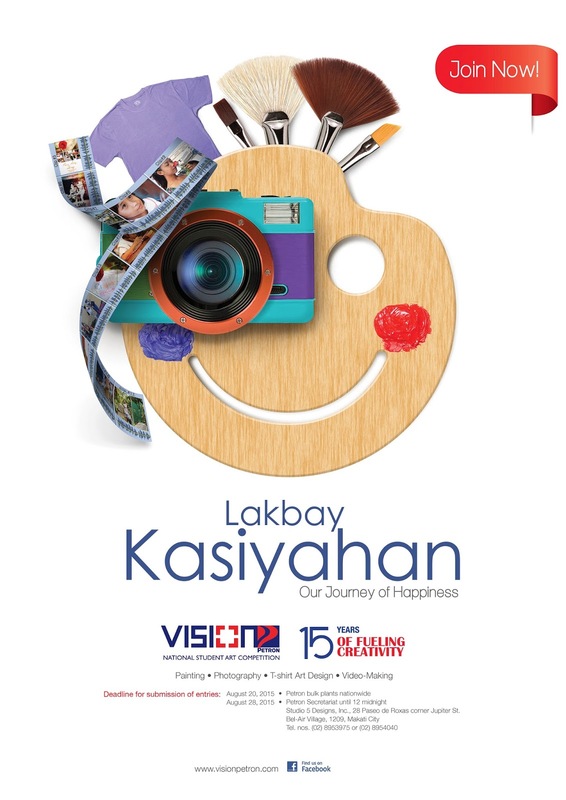 Working on this year’s theme—Lakbay Kasiyahan—the Vision Petron 2015 winners delved into the well-known cheerful character of Filipinos, who have proven themselves to be among the happiest people on earth. Always looking at the bright side and hoping for the best while dealing with life’s challenging situations, the Filipino national character is deeply rooted in their abiding faith, and best experienced with loved ones, or in community festivities. For its consistent wins over the years, the Public Relations Society of the Philippines (PRSP) has awarded Vision Petron with a Hall of Fame Award for winning the Anvil Award of Excellence in the PR Tools/Publications category eight times since 2001. The Vision Petron Art Collaterals have also been recognized with the PRSP Gold Legacy Award for having earned nine Excellence and one Merit Anvil Awards over the years.